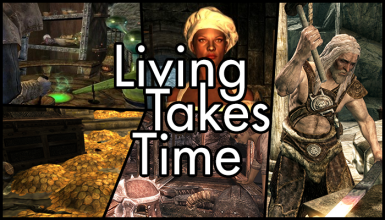 This mod is for everyone that uses realism mods to enhance gameplay and adds to that making time pass when performing actions like reading, eating, crafting and training. Each menu has separate time and activation options. Fixed a bug where the mod would stop working after reloading a save. Fixed a bug that prevented the mod to work after opening a book during combat. This mod is for everyone that uses realism mods to enhance gameplay and adds to that making time pass when performing actions like reading, eating, crafting and training, you can use the MCM menu to set every option as you prefer and customize your game experience. Use posts, any suggestion and criticism is well accepted! Download and activate using NMM. Use the MCM page and deactivate the mod, save the game then deactivate and remove using NMM. This mod requires skse and SkyUI. The mod is compatible with all books, food, armors and weapons from all DLCs and mods. 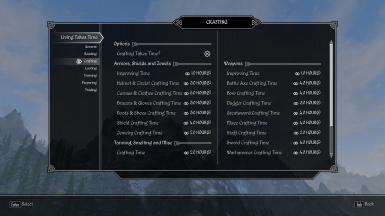 For the crafting module, weapons and armors from mods will fall into the right category if the mods author has set the right keywords for the item, otherwise it will fall into the armor timing for armors or ammo timing for weapons. Works with mods that change the timescale. Q: I have installed the mod and now i can't use the ESC menu, what can i do? A: The ESC menu is actually the Journal menu so if you have the "block journal during combat" option active you won't be able to use it when in combat, if you just updated and want to set the mod find somewhere safe and wait a bit to exit combat, now you can use the menu as normal, note that time will be calculated and forwarded when you close the menu, you can remove this using the MCM. Q: What can i use to pause the game now that i have all options active? A: The Tween menu opened with the TAB key, the Favorite menu opened pressing Q and the Console are safe for pausing the game, time never gets calculated in this menus. Q: I only want the Block action during combat feature but not the time forward, what can i do? A: You can activate the module you want and set the time multiplier to 0, this way time won't pass but you'll still have the block in combat function. Q: I have installed XYZ armor/weapon mod, but when i craft the pieces, the time is not calculated correctly, why? A: The mod uses item keywords to identify what kind of item you are crafting and if it doesn't match it will default to armor timings in case of armor pieces or to ammo timings for weapons, there is no way for me to fix this so ask the mod author to include the correct keywords for each piece. Check out my other mods.